Our Lowcountry Shrimp Boat collection is one of my favorites from the spring/ summer ’12 smocked clothing line. The bishop gown features an authentic smocked shrimp boat with a hand smocked shrimp and seagulls flying around. The bishop gown and shortall are on a brilliant red fabric. What child wouldn’t be proud to wear this adorable smocked outfit? Even better, the colors were designed to be worn on our red, white and blue holidays! You will love seeing your children frolic around on the Fourth of July, Memorial Day and Labor Day! No one wants to be stuck with flags and how much more exciting and fun are boats? There are plenty of shrimp festivals coming up in the next month up and down the coast. The festivals are a celebration of the beginning of shrimp season where the boats are blessed for a bountiful season before they voyage the high seas. It is a wonderful festival for the community and a celebration of supporting your local shrimpers! We have been receiving lots of orders for children attending these festivals and can’t wait to see their pictures! The Blessing of the Fleet Festivals are bound to be more colorful this year with our bishop gowns and boys shortalls running around. 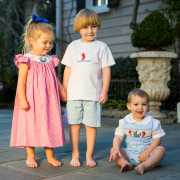 Palmetto Moon Clothing for Children! New Spring Summer Sneak Peek! Is the smocked lowcountry shrimp boats collection still available for purchase? Hi Rachel! Yes, we have some sizes left in the Lowcountry Shrimp Boat collection. 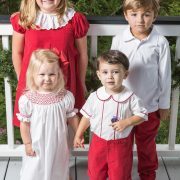 Here is the link to the outfits: http://crescentmoonchildren.com/?product_cat=the-wharehouse-sale-items You can also find them by going to our website, http://www.crescentmoonchildren.com and clicking on the SALE tab. There are several pages of sale items so make sure you take a good look! Let me know if we can help you any further.